Many people think of lifting weights as an exercise reserved exclusively for adults. In actuality, children who lift weights experience many of the same benefits as adults who lift weights. They can also begin lifting weights much earlier than you may realize. According to the American Council on Exercise, children can begin their journey with lifting weights around the age of 7 or 8, or as soon as they understand how to follow directions. As soon as your child is ready, start including strength training three days a week as part of your child's recommended 60 minutes of daily exercise. It is much easier for children who are 7 or 8 to understand ideas that are not abstract. Although it is certainly true that lifting weights will help improve your child's body composition and bone density without stunting his growth, these ideas will not likely spark your child's interest in lifting weights. To initially ignite weightlifting enthusiasm, talk to your child about how much fun he can have and how much better he can become at a sport or something he really enjoys by lifting weights. Once your child is curious and even excited about lifting weights, decide how you will integrate weightlifting in a consistent routine. Plan to help your child work every major muscle group. Start with very light weight and ease into a strength-training program gradually. Focus on helping your child establish good form and offer consistent feedback and encouragement. Remember that your child's physical education teacher, personal trainers and other fitness professionals in your area can all be helpful resources. Children sometimes have short attention spans or just get bored quickly. Keep your child's strength-training exercises interesting and fun. In addition to actual weights and dumbbells, surprise your child by having other weighted objects to lift. Think about things you may have around your home. such as water bottles, canned food or even bricks. You can also use other resistance-training equipment such as resistance bands and medicine balls. When you keep it fun, you will be more successful at holding your child's interest. Although lifting weights is an important aspect of a healthy fitness program for your child, aerobic activity and bone-strengthening exercises are also important. In fact, aerobic activity should comprise the bulk of your child's daily hour of exercise. Your child can get sufficient aerobic exercise by running, playing tag or participating in sports. Activities that involve running and jumping are also effective bone-strengthening exercises. 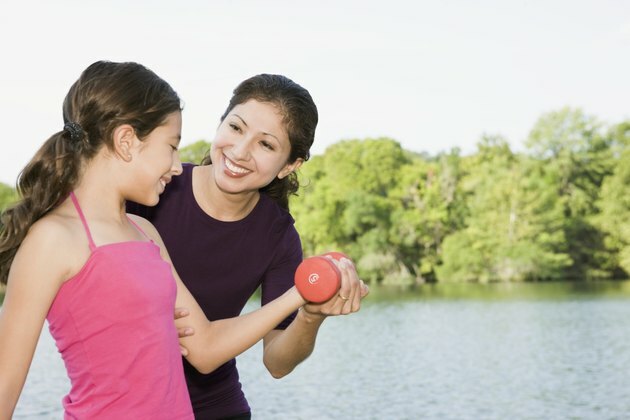 Mix up your child's exercise routine and consider joining in on the rewards of a fitness-filled routine.